Kimberly Phelps is using the skills her grandmother taught her to raise money for her South Hampton Roads Walk to End Alzheimer’s team. 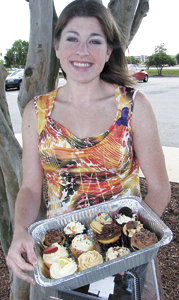 She is baking cupcakes in memory of her grandmother, Dorothy Jane Athey Nance, who passed away from Alzheimer’s disease. To order cupcakes call Kimberly at 641-1310 or email her for a list of cupcake flavors: KimicalKreations@hotmail.com. You must pick up your order near downtown Suffolk.